Posted By:Unknown | At:6:39 AM Be the first to comment! I've seen some pretty damn offensive political ads in my day, but this one that's being pushed in Pennsylvania (and I'm pretty sure other battleground states) takes it to a whole 'other level for me. My boss came into my office to discuss how disgusted he was with an ad that aired at exactly twenty minutes to 6PM on yesterday. He said it was only a ten second spot, but as soon as his wife saw it she said she had had enough and that she was going to go and vote for Obama on Tuesday. Initially, she had decided she wasn't going to vote at all, but the airing of this ad changed her mind and swayed her to the President's side. 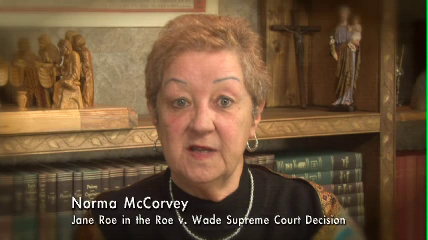 The ad is an ant-abortion ad that features Norma McCorvey who happens to be 'Jane Roe' in the Roe v. Wade trial that allowed for legalized abortion in this country. Aborted fetuses are shown during the spot along with McCorvey encouraging people not to vote for the President because and I quote, "He murders babies." Now in order to watch the video on LiveLeak's website I had to be 18 years or older, but yet the television airs the video only with the disclaimer, "This Video Is Not Suitable for Children." If the video is not suitable for children then why air it during the time when children are most likely to be watching television? This is one of the most disgusting and dishonest things I have ever seen.